Summary: In this post, we shall be studying the differences and crossovers between these two iCloud music-streaming services(iTunes Match and Apple Music) in order for you to know the one that suits you best. Part 1: What is iTunes Match? Part 2: What is Apple Music? Part 1. What is iTunes Match? iTunes Match is an iCloud-based music streaming service that adds all your music to the iCloud Music Library using iTunes on a Mac or PC. Hence, iTunes Match gives you access to all of your music; songs that you’ve imported from other sources such as Android smartphones, CDs, recordings, voice notes, etc. on all your devices. If you want to subscribe to iTunes Match, you’ll need to have iTunes 10.5.2 and above on your Mac or PC. iTunes match can help you to access your songs and playlists on other devices with iCloud Music Library turned on. You can easily get access to your iCloud Music Library by signing in to any iOS device, Mac or PC using the same Apple ID that you used with iTunes Match. iTunes Match will upload your Music to iCloud and let you stream them online vial iCloud Music Library. iTunes Match is limited to 100,000 songs, 200MB of file size, and 2 hours of file length. Songs containing DRM (Digital Rights Management) won’t match or be uploaded to iCloud Music Library. A yearly subscription fee of $25 is required to keep using iTunes Match. Part 2. What is Apple Music? If you have an Apple Music subscription, you are entitled to all the benefits of iTunes Match, and additional access to the entire Apple Music catalog. Hence, with a monthly subscription fee of $9.99 for a single membership plan, you are entitled to get the features and benefits Apple Music offer: Apple Music streaming, Beat 1 radio and Connect social network. Apple Music has the greatest and most robust collection of music on the planet. It offers five subscription/membership plans: monthly individual subscription, annual individual subscription, family subscription, student subscription, and Android smartphone user subscription. Apple Music App offers you access to millions of songs, music recommendations, curated radio, and playlists. With Apple Music subscription, you can access your Music across all your mobile and desktop devices. With Apple Music membership, you can download music to listen to offline. Music files you can stream through iCloud Music Library when using iTunes Match will stop playing immediately your subscription expires. Every offline music you downloaded from Apple Music is trapped in DRM and would stop playing immediately your subscription ends. iTunes Match is limited to 100,000 songs, song files smaller than 200MB, and songs less than 2 hours of play time. Nevertheless, Apple Music and iTunes Match may seem the best bet on streaming music online because you are yet to hear their restrictions and limitations. It’s pertinent to mention that Apple Music files that you download to play offline will be invisible immediately the subscriptions expire. iTunes Match and Apple Music are too expensive to maintain, but that’s not the painful side to it. The most painful this in using these music-streaming services is that you don’t get to keep your music files when the subscription expires. This policy has affected too many iTunes Match and Apple Music users who could not afford the subscription fee anymore. However, there is a way to upload a limitless number of music files to iPhones, iPads, or iPod touches without Apple Music or iTunes Match, and that tool is iMyFone TunesMate. iMyFone TunesMate can help you to transfer music to your iPhone from iTunes, PC, flash drives, CDs, Android smartphones, Windows phones, Blackberry devices, and other music devices. 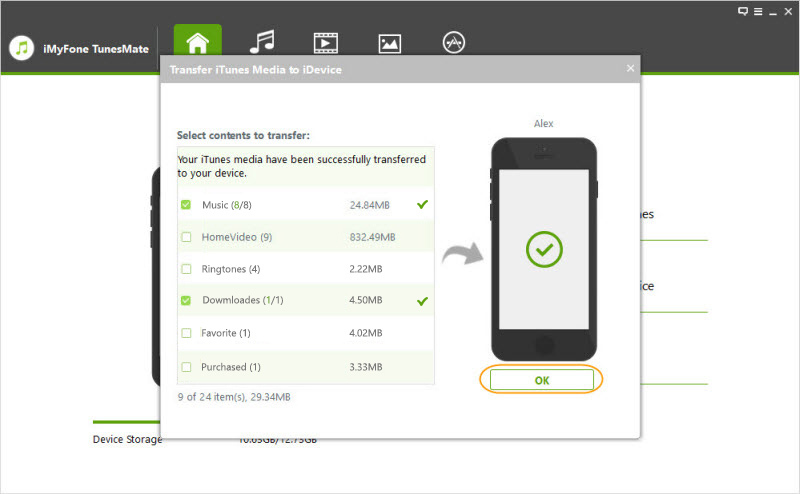 This app doesn’t set any form of limit or restriction to music transfer between iOS devices and iTunes/PC/Mac. iMyFone TunesMate can sync multiple iTunes libraries to iOS devices. TunesMate can rebuild damaged and corrupt iTunes Libraries. TunesMate can transfer every type of Media files that iTunes Match or Apple Music can’t support. You can create Ringtones from your desired songs suing TunesMate. Step 1. Connect your iPhone to your PC using a USB cable. Step 2. 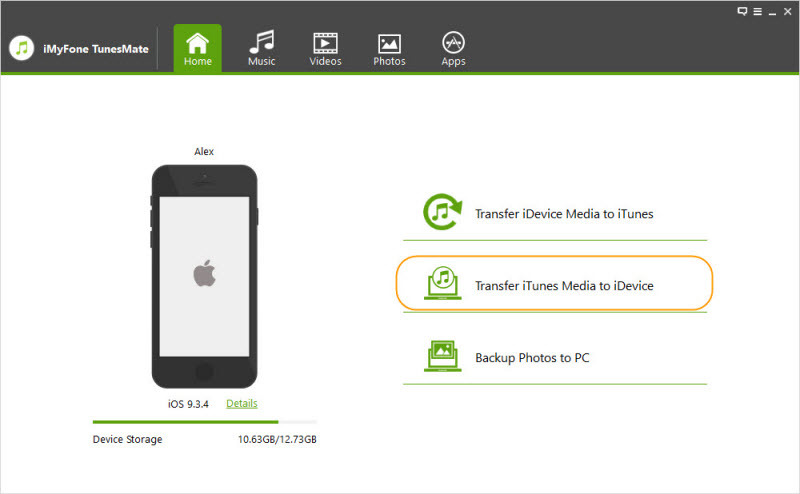 Click the “Transfer iTunes Media to iDevice” tab on the Home interface. Step 3. After the scans, your entire iTunes library will be ticked for export. You can unmark some or click “Transfer” to transfer them to your iPhone. Therefore, there is no need of wasting your money on iTunes Match or Apple Music monthly or weekly subscription fees. Just download and install TunesMate to start enjoying unlimited music on the go.